A Storage area network (SAN) is a dedicated network that provides access to data storage and operations only on the block level. 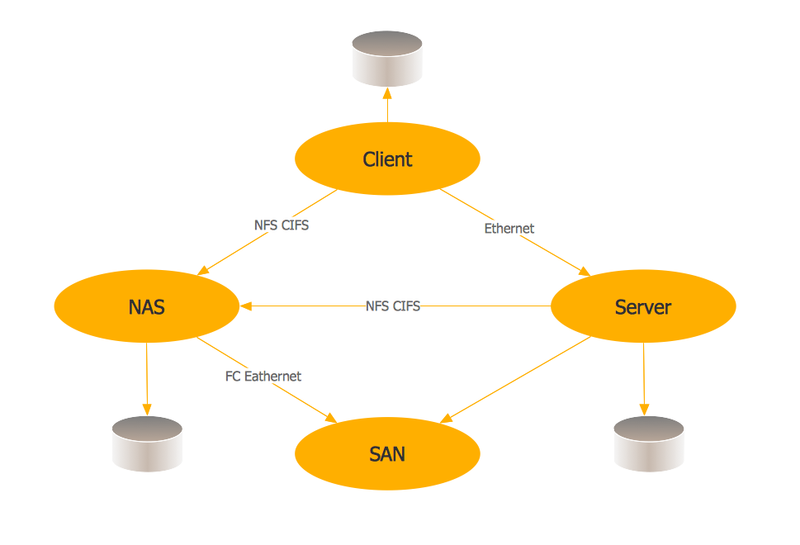 SAN usually has own network of storage devices/elements and disk arrays that are connected with each other and to a remote data-sharing network. SANs are widely used for enhancing the storage devices (optical jukeboxes, disk arrays, tape libraries) that are accessible for networked servers. ConceptDraw DIAGRAM is a powerful diagramming and vector drawing software that allows quick and easy draw the Storage area networks (SANs). Computer and Networks Area provides solutions that contain the libraries with great number of predesigned vector stencils, a set of professional looking examples that you can change for your needs. Example 1. Storage area networks (SAN). This example was created in ConceptDraw DIAGRAM using the Computer and Networks Area of ConceptDraw Solution Park. It shows the hybrid of Storage area network (SAN) and Network Attached Storage (NAS) technologies.